There are many reasons a pipe can be blocked. Obvious situations people first think of are too much toilet paper, or a child’s toy being flushed down the toilet. 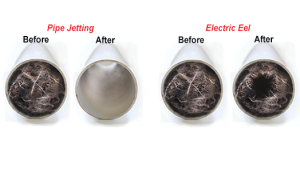 Other causes that you may not always be aware of are things like tree roots growing in the drain pipe or the pipe not being installed in the ground correctly with enough slope for the sewer to flow easily. Tree roots can enter a sewer pipe through a break in the pipe or through a joint that has not been properly sealed. The internal environment of a sewer pipe is perfect for tree roots to thrive and grow vigorously once they have gained entry. This is because they have a constant source of water and nutrients available for them to grow. They eventually grow enough to partially or fully block the pipe and toilet paper snags on the roots easily as it attempts to travel down the drain. People often wash the left over fat from their frying pan down the kitchen sink instead of wiping it out with a paper towel and putting it in the bin. When the fat goes down the sink on a regular basis it becomes solidified where it reaches the water in the ‘S’ bend under the sink. The fat will stick together and become a big ball of fat, eventually blocking your house pipes. Products like ‘flushable wipes’ advertise that they can be flushed down the toilet. Unfortunately they do not break down once wet like toilet paper does and will often build up in the pipe and cause a blockage. This is a very common cause of blocked drains and people don’t realise that items like wet wipes can cause so many problems. 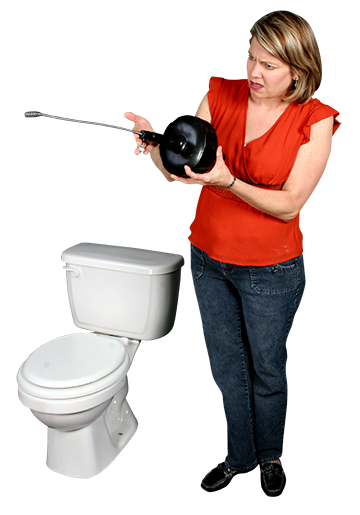 Flushing hygiene products down the toilet create similar problems because they do not break down once wet and can snag and get caught on the joints inside a sewer drain. Pipes under the ground can become broken or cracked as a result of shifting soil, heavy machinery driving over the area above the pipes, incorrect building or landscaping works or corrosion over time. 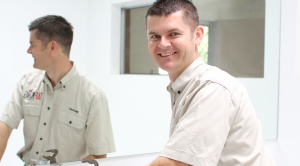 Once the pipe is damaged or cracked, toilet paper can catch on the broken pipe, build up and create a blockage. 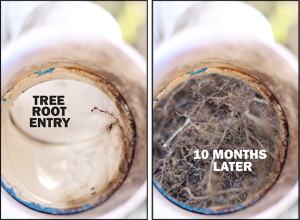 Tree roots can also enter the pipe at the damaged area and grow into a mass of roots, restricting or blocking flow.